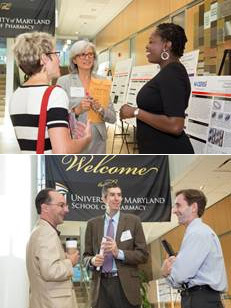 On Sept. 5, the University of Maryland hosted the second annual M-CERSI Day to celebrate the work and progress made by the University of Maryland's Center of Excellence in Regulatory Science and Innovation (M-CERSI) since its inception in 2011. The event, which was held at the University of Maryland School of Pharmacy on its Baltimore campus, featured speakers from industry and the Food and Drug Administration (FDA), also offered participants the opportunity to discuss current issues in regulatory science. M-CERSI is funded by an initial $3 million grant from the FDA, and is co-directed by William Bentley, PhD, the Robert E. Fischell Distinguished Professor of Engineering and founding chair of the Fischell Department of Bioengineering at the University of Maryland, College Park, and James Polli, PhD, the Shangraw/Noxell Endowed Chair in Industrial Pharmaceutics at the University of Maryland's School of Pharmacy in Baltimore. The center is a collaborative partnership between the FDA, the University of Maryland, Baltimore, and the University of Maryland, College Park that focuses on modernizing and improving the ways in which drugs and medical devices are reviewed and evaluated. "Collaborative projects such as the Center of Excellence in Regulatory Science and Innovation are the wave of the future," said Natalie D. Eddington, PhD, FAAPS, FCP, dean and professor at the School of Pharmacy. "This center signifies the fantastic scope of research capabilities across the campuses of the University of Maryland, Baltimore and the University of Maryland, College Park; the synergy shared by faculty who specialize in health science, engineering, public health, and regulatory science; and highlights our collective expertise in the area of regulatory science." The event kicked off with remarks from Eddington; James Polli, PhD, the Shangraw/Noxell Endowed Chair in Industrial Pharmaceutics at the School of Pharmacy and co-principal investigator of M-CERSI; and Frank Weichold, MD, PhD, director of regulatory science and innovation at the FDA. Polli spotlighted the America's Got Regulatory Science Talent competition hosted by M-CERSI earlier this year, emphasizing the unique way that the competition engaged students in the regulatory science field. While last year's M-CERSI Day, held on the College Park campus, spotlighted speakers from industry, this year the focus was on regulatory science initiatives currently underway at the FDA. "The FDA can play a significant role in stimulating dialogue, defining problems, and interacting with researchers to modernize and improve the pathway of product review and approval," Weichold said. Speakers Charles Cooper, MD, medical officer in the Office of Translational Sciences at the FDA, and Shashi Amur, PhD, biomarker qualification scientific coordinator at the FDA, presented potential approaches to streamline and modernize the review and approval process for drugs and medical devices. Cooper advocated for additional review standards and improved consistency among reviewers, while Amur noted the important role of biomarkers as a potential drug development tool. "The FDA has initiated biomarker qualification to help determine which biomarkers can be relied upon to have a specific interpretation and application in drug development and regulatory review," said Amur. "Although it is currently a voluntary process, it remains a very valuable pathway for the indication of biomarkers that can be used in multiple drug development programs." Industry speakers included Jason Connor, PhD, a statistical scientist at Berry Consultants, and Sanjay Sehgal, PhD, managing director at Aexelar Regulatory Experts, LLC. Connor offered his thoughts about how clinical trials could be redesigned to benefit patients, health care providers, and manufacturers, saying, "I propose that we end clinical trials as soon as we know the answer to help optimize the drug development process and ensure that these trials are conducted in the most efficient manner possible. The faster we can do trials, the faster we can report answers and submit new drugs for approval." Sehgal examined how the process required to submit a specific type of new drug application (NDA) - a 505(B)(2) NDA, which is often filed by companies that seek to reposition a drug that has already been approved by the FDA - could be streamlined to encourage innovation in drug development and avoid duplicated studies. Closing the morning session, Robert Lionberger, PhD, acting deputy director for science in the Office of Generic Drugs at the FDA, spoke about ongoing research initiatives in his office and the important role that regulatory science has in ensuring that the office continues to produce safe and effective generic drugs for the American public. "Regulatory science leads to better decision making in both the FDA and private industry," said Lionberger. "It helps the FDA provide better advice and support for its recommendations to companies before those companies begin the drug approval process. It also helps to improve the industry's drug development process. When both the FDA and industry follow good science, there's an increased likelihood that there will be an alignment between the two sectors, particularly on areas for which guidances and other regulatory standards have not yet been established." The afternoon agenda consisted of four closed-door sessions attended by researchers from the University of Maryland and the FDA, members of the M-CERSI Advisory Panel, and members of the M-CERSI Industrial Consortia. These sessions focused on ongoing research related to four key priorities at the FDA, including improving pre-clinical assessments of safety and efficacy, ensuring readiness, harnessing diverse data, and minority health. To build on the progress made this year, the center plans to launch two new academic programs - a certificate program in regulatory science and engineering at the University of Maryland, College Park and an exclusively online master's program in regulatory science at the University of Maryland School of Pharmacy, and a personalized education program to better leverage the expertise of faculty at both the Baltimore and College Park campuses. For more information, visit cersi.umd.edu.